Youtube mp3 converters have been my kinda obsession for the past couple of months, since i’ve seen that case unfold against youtube-mp3.org. Lots of new players have shown up since then, lots of random websites all of a sudden get tremendous traffic boosts from google, since many millions of people now are looking for new ways to convert youtube to mp3. So here comes YoutubeMp3.Today – a site that is late to the spoils, but still wants to gobble up some traffic. This site is quite cool and is in part associated with savetube, so we do have a link to it on top right there in the sidebar.. Please, check it out! 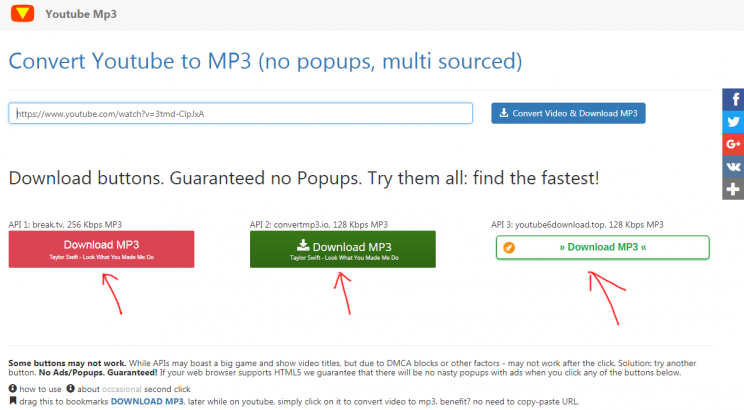 These days there are very many sites that do youtube mp3 conversion. What is so amazing about this one that it warranted a review from us on such early stages of its existence? How does this site stand out in a myriad of other similar sites? Cause when it boils down to the essence, using all these sites involves a subset of the following actions: copying video URL, inserting it, pressing a button, closing some ads and popups, and downloading your mp3. Secondly, youtubeMP3.today doesn’t do mp3 processing or anything really with the audio.. That is left to an array of APIs presented by other sites and sources. What is an API? It is a set of tools that allow some website or robot do all the actions that you would do manually to achieve some solution to a task. So in this case youtubeMP3.today acts as a middleman between you and that other site that actually does the youtube-mp3 conversion. Why is that needed? Because that other site is a prominent player on the youtube to mp3 scene, and doesn’t care about its users, so they stuff page with ads and popups and anywhere you click – malware wants to get in, some search bars, etc. That is why youtubeMP3.today comes into play. Using the cool HTML5 iframe sandbox feature, youtube-MP3 is able to suppress any popups that would otherwise show up and upset you with their unwillingness to leave the screen.. That is the power of HTML5. So user experience basically ends up being selecting which button to press, and then press it. And download starts automatically on all of the offered options. This is another cool aspect of having multi-API sourced service. 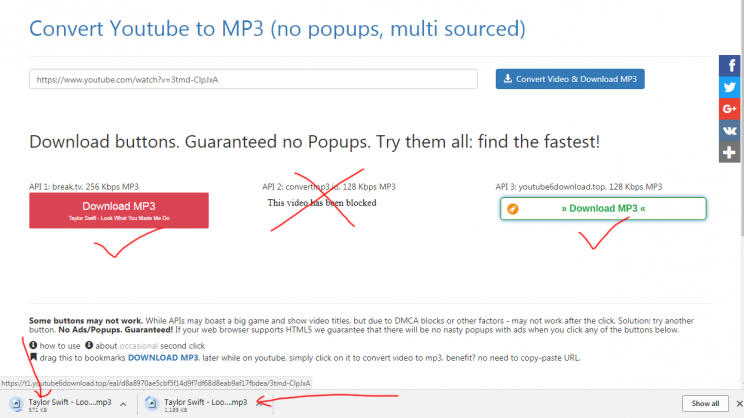 These days the more popular youtube-mp3 converter is, the more chances that it will have some URL blocked by some DMCA request. Each up and coming site has this “feature” when you can contact them and stop some certain video from being accessed by users coming to this site. Not so fast… There are other sites that are much smaller and will process your video gladly… In the example step-by-step guide below you can see that one of the buttons doesn’t work, says “resource is blocked”, while 2 others are fine and ready to rumble. Hence having multiple sites do work for your site is actually a good idea, this way your visitors can enjoy a number of sources and chose the one that speeds are fastest etc. now let’s see how to get your own free copy of Taylor Swift Look what you made me do song. This will be our step by step guide on how to use youtubemp3.today. below is the screenshot of what this site looks like right now middle november 2017. Step 3. Select your download source. No popups guaranteed! So now is the step that on any other site you will see a popup or some nasty ad. now with youtubemp3.today though! thanks to their prevention of popups, you are now safe to click any of the 3 buttons showed up and start your download. Each button indicates expected audio file bitrate. Step 4. Press button(s) and begin the download(s)!! Now simplyy choose which button you like most and click it! Or click all 3 and see which one downloads fastest. When clicking the middle button you can see what i meant above: video was blocked on the most famous of 3 sites, but the 2 less famous ones actually process it with pleasure. In this screenshot you can see I have 2 mp3s downloading at this very moment. One ends up being 256kbps audio quality, another is 128kbps. this video was made some time ago… now it may look different, but we still add it in here..
youtubeMp3.today is a cool minimalistic site with aspiration for greatness. it’s only been around for a few months, but has already helped thousands of people and is getting the word out there about itself in a very nice way – by helping people. multi-sourced downloads ensure no video will be blocked by all of those sources, thus there is always one source that’ll let you get the mp3. it’s cool to use youtubemp3.today. 5 star rating from savetube, that’s for sure! !